We have all heard about the DNA that is found within our nucleus which determines our physical characteristics (eye colour, hair colour, height etc) and the vast majority of the components (called proteins) that make our cells and bodies work. But not all the DNA within our cells is found in the nucleus, there is some DNA within the mitochondria. This DNA is much smaller than the DNA within the chromosomes, it contains only 16,500 base pairs compared to over 3 billion pairs in the nuclear DNA. Mitochondrial DNA is much smaller than the DNA within the chromosomes, it contains only 16,500 base pairs compared to over 3 billion pairs in the nuclear DNA. This is highlighted in the diagram below. 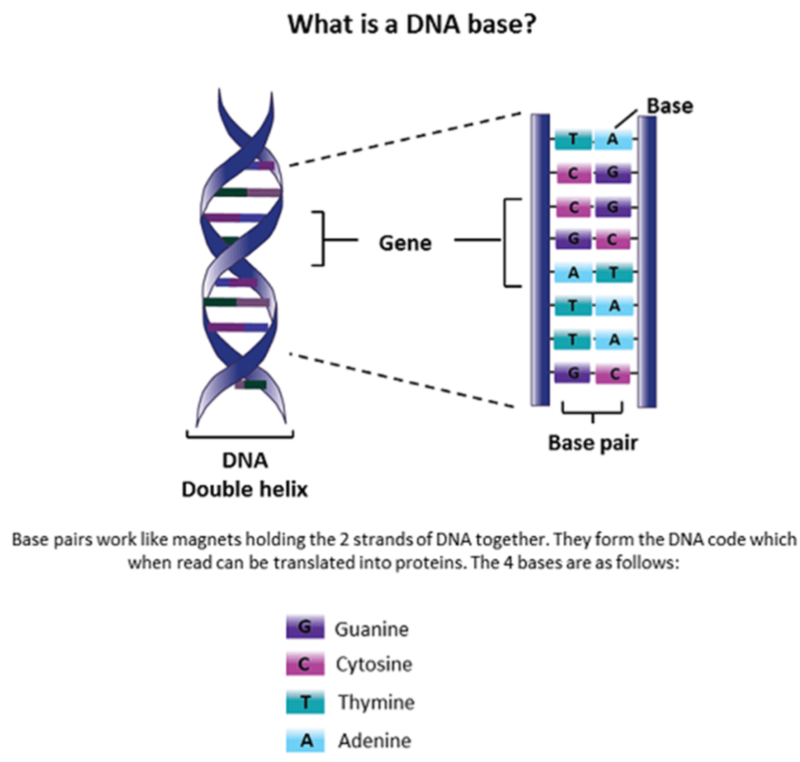 Base pairs work like magnets to hold the two strands of DNA together (shown below), the bases form the ‘letters’ of the DNA which when read correctly can be translated into proteins that the cells need to function. The DNA within the mitochondria forms a circle, similar to the DNA within bacteria, and different to the DNA within the chromosomes. While each cell contains only two copies of each chromosome each mitochondria contains many copies of the mitochondrial DNA and there are many mitochondria in each cell. For a printable, quick summary of the information on this page please click here. 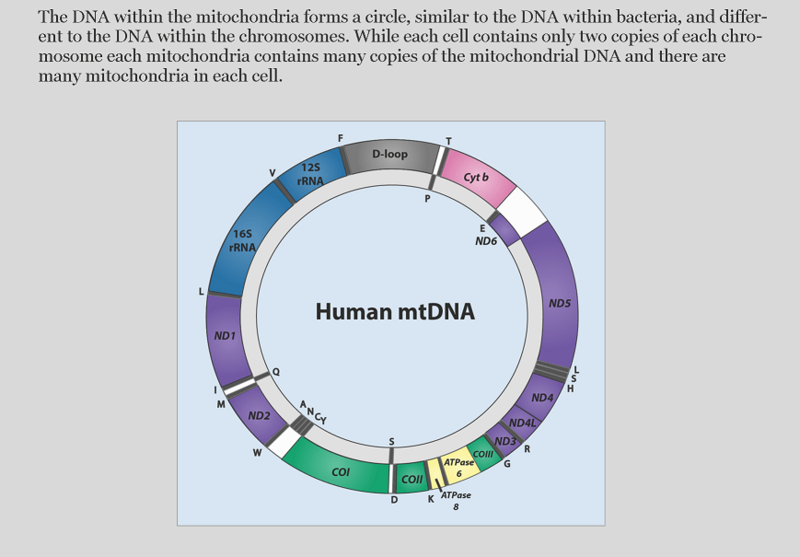 Why is mitochondrial DNA important? Mitochondrial DNA contains vital information that allows the mitochondria to make the proteins it needs to make energy and hence our cells work properly. 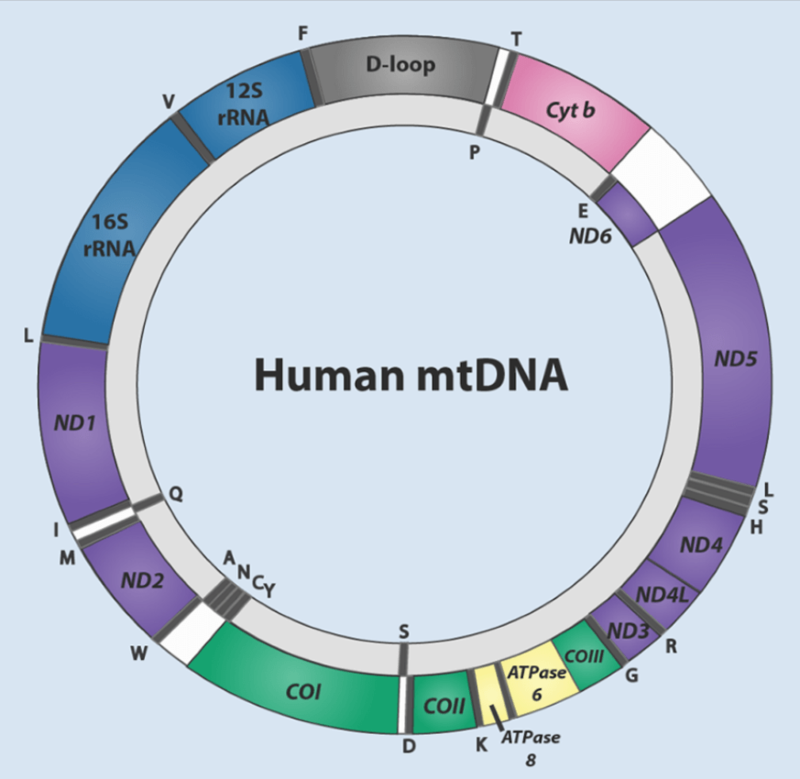 If the mitochondrial DNA contains mistakes (mutations) this may cause disease. The DNA contained within our nucleus comes from both our parents. However when it comes to mitochondrial DNA the situation is slightly different. Children inherit their mitochondrial DNA from their mothers only. The DNA contained within our chromosomes comes from both our parents. Our cells contain 23 pairs of chromosomes, so 46 in total. Each egg and sperm contain 23 chromosomes which are not paired, upon fertilisation the pairs of chromosomes join together so half your DNA comes from your mother and half from your father. But when it comes to mitochondrial DNA the situation is slightly different. Although both sperm and egg cells contain mitochondria, the mitochondria from the sperm are broken down shortly after fertilisation, which means that all the mitochondria, and all the copies of the mitochondrial DNA in the fertilised egg are from the mother. This means that since children inherit their entire mitochondrial DNA from their mothers it follows that it is only women that can pass on the mutations within this DNA that cause disease.